The following article was originally published as a special to NHL Hot Stove on January 21, 2010. It is reproduced here in its entirety for archival purposes. The Nashville Predators are flying high in the highly competitive Western Conference and appear to be headed to a return to the postseason after missing the playoffs for the first time in five years last season by a mere three points. The Predators do not have any players considered to be "stars" in the big picture of things in the National Hockey League. The Pred's success is based on a gritty brand of hockey where many different players can be the star of the game on any given night. Team leaders include Captain Jason Arnott, Steve Sullivan, Martin Erat, J. P. Dumont, Patric Hornqvist and young defensemen Shea Weber and Ryan Suter. None are likely to appear on the cover on NHL11 and most get overlooked in round table discussions of top players on the NHL Network. The Predators have surprised folks this season with their resiliency and the break out years by Patric Hornqvist (19 goals) and Shark's castoff, Marcel Goc (9 points so far is his career high). The basis for Coach Barry Trotz's success has been his "Band of Brothers" mentality where the whole is far greater than any of the individual pieces of the team. Recently, Trotz explained that what he considered the "core" of the team was not the top five or six players or the leadership group, as most coaches would say, but the 26 or so players that have played and contributed to the team's success so far this season. It takes a special player to play within that type of system. Alexander Radulov never quite understood that he wasn't a bit more special than anyone else, so he spent the majority of his time in Nashville in or close by Barry Trotz's dog house. One of the worst trade deadline deals in franchise history was the Pred's pick-up of Peter Forsberg as the team was desperately trying to go deep in the playoffs in order not to be sold late in the 2006-07 season. In spite of his talent, Forsberg was not a "Trotz-type" player and never provided any cohesiveness to the team. After amassing the third highest point total in the regular season, they disappeared immediately in the first round of the playoffs. The Predators best deadline acquisition was the little known Czech player Jan Hlavac, who came to the Preds in 2008 and stepped into a second/third line role position and contributed 13 points in 18 games down the stretch. He realized why he was here and was willing to do what Barry Trotz wanted. Last season, to the chagrin of many in Pred Nation, who wanted to sign a couple of big names to give the Predators a needed push into the playoffs, the Predators let deadline day come and go with out a single deal, or really many good rumors. This season as the trade deadline approaches in early March, the Predators have a number of players that will be unrestricted free agents or restricted free agents at the end of the year. With Nashville's well known budget constraints, many of their current players will move on for more money elsewhere at the end of this season. Will the Predators try to recoup something prior to the deadline or use their assets for the remainder of the season and stand pat as they did last season? The key pieces that will command raises on the open market include defenseman Dan Hamhuis, agitator Jordin Tootoo and both of the Pred's netminder's Pekka Rinne and Dan Ellis. Taking a look at each of these players and the chances that hey will be moved at the deadline is an interesting proposition. Dan Hamhuis is unlikely to return to Nashville next season as the Predators have several young defensemen that need a place to play. Cody Franson has been a true surprise and Kevin Klein as transitioned to the second defensive pairing and will be the leader there next season. Therefore, I will project that Hamhuis is the most likely roster player to go at the deadline. Jordin Tootoo is very hard to figure as far as his value is concerned. He has missed 28 games in two stints on the injured list this season and may not play much before the trade deadline. It is doubtful that he will be traded. Re-signing him is a real enigma as he is probably worth more to the team's marketing department than he is as an on ice commodity. Prior to his recent injury, I had suggested to my blogger buddies that I wanted to see a trade where Tootoo would go to frequent trading partner, Philadelphia, in exchange for Dan Carcillo and a second or third round draft pick. That would eliminate the need for enforcer Wade Belak and give Pred fans another agitator to learn to love. In reality, it won't happen. One of the Predator goalies will not return next year and my bet is that Dan Ellis will be elsewhere. The Preds do not have anyone ready to move in the second spot but there is a glut of back-up goalies that could be had for less than a million dollars giving the Preds room to resign Rinne to a nice contract in the $2.75 to $3 million dollar range. I do not think that either goalie will be moved at the deadline as the Preds are dependent of the current rotation and have an incredible amount of games after the Olympics where both netminders will see plenty of playing time. Finally, given the above analysis, what will the Nashville Predators do at the deadline? I have two answers... little or nothing. On the nothing side of the table, the Predators may stick with their "core" of twenty six players and hope that Barry Trotz will have more rabbits in his hat to convince the team that hey can continue to play with the leagues best and make it to the second round of the playoffs for the first time with what they have. One added piece to the puzzle that may develop over the next few weeks would be the return of future star Colin Wilson who appears healthy for the first time this season and is just now rounding into shape in Milwaukee. If he could play as anticipated and work into a top three line center spot, he could be as helpful as a trade pick-up. In the little category, the Preds could add a veteran or a role player to add depth to the young squad that has played well beyond their years. It is difficult to speculate on specific players that may be available but you would have to think it would be a player from the Eastern Conference from a team that feels they are out of contention. Carolina scouts have been constant visitors to the Pred's press box over the last few weeks and Ray Whitney is probably available since he will be a UFA at season's end. The Islanders have also had scouts around but Doug Weight is the only player that looks like a rent-a-player and I can't imagine that the Preds would be interested. I would be surprised if a Pred's deal would involve more than draft pics for a rental player. If a deal were made for someone they would like beyond this season then I could see a Hamhuis or a prospect going the other way. Therefore, as a realist, knowing the Predators economic situation and the David Poile/Barry Trotz dynamic, look for the Preds to do little or nothing at the deadline. I can hear the groaning from those who want a big name player or a glitzy name thrown around on the rumor sites, but I think the Predators have a plan that they intend to follow and unlike the last few years, it will be more fruitful and take them at least to the second round, if not further. Barry Trotz has surprised the experts so far this season and will continue to do so as we head to the post season. Nick Spaling was returned to Milwaukee today after playing well in his 21 game stint in Nashville. Barry Trotz indicated after last night's game that Marcel Goc would be ready on Tuesday so a move was needed. It is somewhat surprising that it was Spaling that was sent down as opposed to Cal O'Reilly. Spaling has be racking up plenty of minutes on the Predator's penalty kill and has been one of the better players during the recent Pred's slide. Nashville, Tenn. (January 31, 2010) – Nashville Predators President of Hockey Operations/General Manager David Poile announced today that the club has reassigned forward Nick Spaling to Milwaukee (AHL). Spaling, 21 (9/19/88), was recalled for the first time in his career on Dec. 15, and has appeared in the Predators last 21 games, posting three assists – including one last night in a 4-3 victory over Atlanta – while averaging 10:42 of ice time. Nashville’s third choice, 58th overall (second round) in the 2007 Entry Draft is also averaging 1:40 of shorthanded ice time in his inaugural NHL campaign, fifth-best among rookie forwards. The Palmerston, Ont., native has seven points (1g-6a) in 27 games for the Admirals in 2009-10. The Predators will look to make it two-for-two on their current four-game homestand when they host the Phoenix Coyotes on Tuesday night at 7 p.m. The home stretch continues Thursday against Colorado, and wraps up Saturday vs. the NHL-leading San Jose Sharks. Tickets these games, and all other regular season contests, are on sale and can be purchased by logging onto nashvillepredators.com. Tickets are also available by calling (615) 770-PUCK and at all Ticketmaster locations. The Nashville Predators ended their five game losing streak by defeating the Atlanta Thrashers 4-3 at the Sommet Center in Nashville on Saturday night. With the win, the Predators have 63 points and remain in seventh place in the Western Conference. Jason Arnott had the game winning goal off the opening face off in the third period. Joel Ward and Marty Erat each had a goal and an assist. Jerred Smithson had the other Predator goal. Pekka Rinne got the win in net for the Preds as he stopped 23 of 26 Thrasher shots that included several big saves at critical times. Atlanta was led by Bryan Little who had two goals and Chris Thiorburg who had the other Thrasher goal. Johan Hedberg took the loss as he stopped 27 of 31 Predator shots. In spite of the inclement weather, the crowd was fairly lively. A contingent of over 400 Atlanta Thrasher fans in the Sommet Center added to the hearty Predator fans that braved the elements to make it downtown on an evening where the streets were as slick as the ice at the rink. The Predators started the game with plenty of energy and struck early when Joel Ward scored on a backhand flipping the puck over the shoulder of Johan Hedberg at 3:59 to give the Preds an early 1-0 lead. The Predators continued to apply the pressure and it paid off when Jerred Smithson put the puck past Hedberg at 9:27 to give the Preds a rare (of late) 2-0 lead. At 13:50, Atlanta came close to getting a goal when Pekka Rinne made a big save that ended a delayed penalty against Francis Bouillon and put the Thrashers on the power play. Seven seconds into the man advantage Bryan Little put the puck past Pekka Rinne to pull the Thrashers within a goal at 2-1. At the end of the first period both teams had ten shots with the Thrashers leading in Corsi numbers 17-15. It was one of the few times lately that the Predators had led at the end of the first period. The Predators went on their first power play of the game early in the second period at 2:39 when Boris Valabik was called for interference on Ryan Jones. At 3:15, Chris Thorburn was called for tripping Steve Sullivan giving the Preds 1:24 of two-man advantage. The Preds were unable to get a shot on goal 5 on 3. The Preds got two shots in the remaining man-advantage time but failed to score. The Predators dodged a bullet at 6:55 when the whistle was blown due to coincidental roughing minors that were issued to Steve Sullivan and Jim Slater. Meanwhile, play continued and the puck ended up in Predator net but was waived off by the officials. The Preds regained their two goal lead at 11:12 when Martin Erat shot the puck as he skated into the high slot, received a pass from Joel Ward, and put it past Hedberg to make it 3-1. Shortly after the Preds goal, at 11:59, Tobias Enstrom was called for holding Steve Sullivan. After a sloppy give-away by Steve Sullivan at the blue line, Marty Reasoner took the puck to the Pred's net and the puck was blocked by Pekka Rinne. Unfortunately, Rinne turned his back to the net giving Chris Thorburn an easy shot into the open net for a short-handed goal to make it a 3-2 game. The Thrashers tied the game 3-3 at 15:02 when the Preds turned the puck over again and Ilya Kovalchuk shot the puck and it was blocked by Rinne but the rebound was picked up and buried in the net by Bryan Little. Pekka Rinne was obviously disgusted with the Pred defenders for not clearing the rebound when they clearly had an opportunity to do so. In spite of the Atlanta 2-1 edge in goals for the period, Nashville out shot the Thrashers 11-6 in the second period. The Preds led the Corsi numbers 21-10. The Preds only had three shots in 4:35 of man advantage time in the period and allowed the short-handed goal. Seven seconds after the after the puck drop to start the third period, Jason Arnott put the Predators back into the lead 4-3. Arnott's goal was a new record for the quickest third period goal, breaking the old 13 second record held by Adam Hall. Ryan Suter possibly saved an Atlanta goal in front of the Pred's net when he hooked Max Afinogenov at 1:18 to put the Thrashers on the power play. The Thrashers did not get a shot on goal on their man advantage. Jason Arnott was sent to the penalty box at 8:54 for holding Jim Slater to put Atlanta on their third power play of the evening. Again, the Preds held Atlanta to no shots. On a horrible call by the officials, Jason Arnott and Boris Valabik were called for coincidental minors at 11:47 when Arnott was slew-footed by Valabik and amazingly the officials did not see what the replay showed. Valabik was called for tripping and Arnott was for interference. Atlanta called a time out at 1:42 and pulled Hedberg. Play was intense through the end of the game but the Predators held on and the game ended in a scuffle in front of the Predator net. The Predators and the Thrashers each had ten shots in the third period. The Preds out shot Atlanta 31-26 and led in the Corsi numbers 52-44. The win was in no way a thing of beauty as many of the issues that led to the five game losing streak were still apparent in Saturday's game. Turnovers, sloppy defensive play, and special teams troubles did not magically disappear. In the post game interview, Barry Trotz admitted that it wasn't pretty or one of their best games but indicated that it may have been their best game at overcoming adversity. The Predators had played on Friday in Detroit and had travel issues getting home. Atlanta had been in Nashville since Friday and were much better rested. The Preds lost focus for a while during the second period and things appeared to be spiraling out of control once again but they were able to regain focus and comeback for the win. Pekka Rinne played a fairly solid game stopping 23 of 26 Thrasher shots but received limited support, at times by the Predator defense. On the game tying goal, the Hamhuis-Klein pairing stood watching instead of clearing the puck after the initial rebound. On several other occasions Rinne was hung out to dry and made the save. If the Predators are to make the playoffs, one of the two goalies will have to get hot enough to carry the load. Pekka Rinne has been thought to be the one that would be the better choice but has failed in his last two attempts to play consecutive games when the recent goalie rotation was disrupted. Atlanta had a contingent of over 400 spirited fans that made the trip to Nashville to take in the game and the Nashville nightlife. The boisterous nature of the visiting fans added a lot to the atmosphere in the Sommet Center. In a rarity, the Preds will pay a return trip to Atlanta this year on March ninth since the Thrashers were designated as one of the wild card teams from the east. It is a real shame that the Preds and Thrashers do not play more often and allow the rivalry to develop in to a regional battle that both teams and their fans would enjoy. The Predators have three more games on the current homestand playing Phoenix on Tuesday, Colorado on Thursday and San Jose next Saturday. They will then hit the road for four final games before the Olympic break. After suffering through 4-2 loss last night against the Red Wings in Detroit, the Nashville Predators (29-21-3) return home to play the Atlanta Thrashers (24-21-8) at the iced over Sommet Center. It seems fitting since it is Hockey Day in Canada and Hockey Weekend Across America that the non-traditional hockey market of Nashville would be converted to an open air ice rink with up to seven inches of snow and two inches of ice covering Middle Tennessee. The Predators could tie their season high six game losing streak with a loss against the Thrashers. The Preds and their fans are hopeful that the streak will be broken and that they can return to the form that they showed when playing well earlier this year. Tonight's game is a rare one against the Thrashers. However, as a wild card team from the Eastern Conference, the Preds will pay a return visit to Atlanta on March 9 and play the Birds at Phillips Arena. This is the twelfth all-time meeting between the two teams as Nashville holds a 5-4-2 advantage. Pred fans will have the opportunity to see Russian super-star Ilya Kovalchuk who has 31 goals and 57 points so far this season. They will also get to see ex-Predator Rich Peverly who has found success after Atlanta picked him up on waivers. Peverly has 17 goals and 42 points this year. Pekka Rinne (18-10-2, 2.81, .903) will start in net for the Predators while the red-hot Johan Hedberg (12-8-4, 2.48, .918) will start for Atlanta. This will be Hedberg's fourth straight start. In his last four games he has only allowed 1.5 goals per game and has stopped 116 of 122 shots. Joel Ward will return to the ice after missing the last three games with an upper body injury. Andreas Thuresson, who was on an emergency recall, was returned to Milwaukee today. Marcel Goc remains sidelined for the Preds and Wade Belak is listed as doubtful. When you have lost five in a row it is difficult to label any game a trap but in looking at the schedule this one would have foot the bill. The Preds cannot have a let down from the intensity that they exhibited during the last two periods of the game against the Wings. The "rivalry" between the Predators closest other NHL team has never been fully developed since the two teams went to separate conferences during the last era of expansion. It is ashamed that the two teams are not able to play six times a year like division rivals. The Predators have not played well in front of the home crowd recently. Since December 26, the Preds are 2-4 at the Sommet Center. Before the recent losing streak, the Predators had a better road record than they did at home. Predator fans have been supportive of the team and deserve to see a full sixty minutes of effort when they pay good money to come out and support the home team. The Predators dismal special team play went further downhill in last night's game as they gave up two goals on four penalty kills officially and another goal three seconds after the power play expired. Dan Hamhuis and Kevin Klein were on the ice for the first three goals and did not play well on the PK. The Power Play unit was much more aggressive, getting off twelve shots in four opportunities on the man advantage but still did not have anything to show for it. If the special teams do not show a quick turnaround soon, the Predators hopes of a post season berth will appear smaller and smaller in the rear-view mirror. After playing a few shifts in Detroit last night, Andreas Thuresson was returned to Milwaukee today. It appears that Joel Ward will be able to pay in tonight's game against the Atlanta Thrashers. Nashville, Tenn. (January 30, 2010) – Nashville Predators President of Hockey Operations/General Manager David Poile announced today that the club has reassigned forward Andreas Thuresson to Milwaukee (AHL). Thuresson, 22 (11/18/87), played in last night’s game at Detroit after being recalled on emergency conditions on Thursday. The Kristianstad, Sweden native has appeared in 22 games for the Predators this season, notching three points (1g-2a) and four penalty minutes while averaging 9:59 of ice time. In 24 games for the Admirals in 2009-10, Thuresson has 15 points (7g-8a). Predators kick off a four-game homestand tonight 7 p.m., when they hosts the Atlanta Thrashers, the team’s closest geographical rival. The home stretch continues Tuesday against Phoenix, Thursday vs. Colorado, and wraps up next Saturday, Feb. 6, against the Western Conference-leading San Jose Sharks. Tickets to all four of these games, and all other regular season contests, are on sale and can be purchased by logging onto nashvillepredators.com. Tickets are also available by calling (615) 770-PUCK and at all Ticketmaster locations. The Nashville Predators extended their losing streak to five games in a 4-2 loss to Detroit on Friday night at Joe Louis Arena. With the win the Wings have matched the Preds 61 points in the tight Western Conference race. Nicklas Lidstrom, Drew Miller and Henrik Zetterberg each had a goal and an assist to lead the Wings to the victory. Jason Williams had the other goal in his first game back after missing eight weeks of play. Pavel Datsyuk and Valtteri Filppula each has two assists. Scoring goals for the Preds were Francis Bouillon and Shea Weber. Jimmy Howard was clearly the star of the game as he stopped 46 of 48 Predator shots while Dan Ellis allowed four goals on 29 Wings shots in the loss. Play at the start of the game was fast and furious with both teams skating full out. Detroit went on the power play early at 3:31 when Marty Erat hooked Patric Eaves. The Wings managed only one shot during their power play. Play continued to be wide open with every inch of the ice being fought for through the middle of the period. Both teams had numerous scoring chances. For the third game in a row a questionable penalty call led to the opponent's power play goal. This time, Ryan Jones was called for hooking Niklas Kronwall at 16:28 when Kronwall clearly was holding Jones' stick. The ensuing goal was scored by Jason Williams with one second left in the man advantage at 18:27. The Predators came back quickly at 19:36 when Francis Bouillon took a cross ice pass from J. P. Dumont and flipped it past Jimmy Howard from the right side face off circle to even the score at 1-1. Detroit out shot the Predators 11-10 for the period and also led in the Corsi numbers 22-17. From the start of the second period until the end of the game, the Predators controlled the flow of the game and had good presence on the ice. The Red Wings returned to the power play at 5:04 in the second when Francis Bouillon was called for slashing on a play where a loose puck had to be swept from the blue ice. At 5:55 Pavel Datsyuk fed the puck to Nicklas Lidstrom who was skating into the slot and lifted it above Dan Ellis into the net to put the Wings ahead 2-1. J. P. Dumont was sent to the penalty box at 6:54 when he hit Brad Stuart with a high stick. Nick Spaling had one of the best scoring chances of the Wings power play on a breakaway the Howard corralled. As the power play expired Drew Miller redirected a Brad Stuart shot past Dan Ellis to put the Wings ahead 3-1 at 8:57 in the second period. The Predators had their first opportunity on the man advantage at 9:54 when Jonathan Ericsson was called for hooking Ryan Jones. The Predators managed four shot but did not put the puck in the net. At 16:20, Patric Hornqvist hit the crossbar on a break away as he was being hooked by Nicklas Lidstrom to put the Preds back on the power play. The Predators got four more shots on the man advantage, again with nothing to show for it. At 18:56 a minor skirmish broke out when Jerred Smithson was cross-checked into the wall by Niclas Kronwall. The period expired with 56 seconds remaining on the carry-over penalty. During the second period, the Predators were playing aggressive, desperate hockey and out shot the Wings 20-10. On the Corsi side the Preds were up 33-16 for the period. The third period started with the Preds continuation of the power play but they did not put either of their shots on net into the goal. The Predators pulled within a goal at 5:57 when Shea Weber snaked a shot through traffic and into the net to make it 3-2. The game was almost tied at when J. P.Dumont and Cal O'Reilly broke toward the Wing's goal and Dumont gave the perfect pass to O'Reilly who went high and nicked the crossbar. The Wings went back up by two on a fluke play when Henrik Zetterberg shot the puck off of Shea Weber and then recovered the rebound at the red line and sent the sharp angled shot at the net and it ricocheted off Dan Ellis into the net to make it 4-2. At 18:25, Brian Rafalski was called for interference giving the Predators one last sign of life. With Ellis pulled and the Preds on the six on four for the remainder of the game, the Preds were only credited with two shots and did not score. The Predators out shot the Wings 18- 8 in the third period and 48 to 29 for the game. Amazingly, the Predators has 81 Corsi shots compared to 51 for the Red Wings. Jimmy Howard had an unbelievable night in goal for the Wings. With the rubber launched in his direction 81 times during the game he had few opportunities to relax. Officially he stopped forty six shots. The Predators had many scoring opportunities and had twelve shots on the man advantage so Howard had many quality saves. It was Howard's first full game against the Predators and he should have plenty of confidence in the remaining three meetings of the two teams. Nashville played far more aggressively than they have in the prior four games on the current losing streak. Eighty-one Corsi shots is close to the season high for number of overall shots attempted, blocked or missed. Again, with no luck on the special teams and scoring twice on 34 even strength shots, it was not enough to win against a quality team on the road. I am not a big believer in the "hockey god" principal but after watching the Preds win so many games earlier this season with what seemed like "smoke and mirrors," a game like tonight could almost convince me that there was something to it. Officially, the Predators penalty kill gave up two goals on four Red Wing power play attempts but the third Red Wings goal came three seconds after the end of a penalty kill on a continuation of play when the PK unit was still scrambling. On the flip side, the Predator power play remained impotent with nothing to show in four man advantage attempts. To their credit, the Preds did have twelve shots on goal and were more active than they have been recently. The Predators are ranked second in the league in five on five goals but continue to struggle on the man advantage. The Predators planned to attempt to return to Nashville after the game in order to prepare to meet the Atlanta Thrashers on Saturday night at the Sommet Center. The Preds play four home games in eight days before finishing up on the road before the two week Olympic break. After losing four in a row and looking fairly comfortable in doing so, the Nashville Predators (29-20-3) head into Detroit to play the Red Wings (25-19-9) in Joe Louis Arena tonight at 6:30 CST. This will be the third meeting of the year between the two teams and the first in Detroit. Detroit lost 3-1 on November 23 and won 3-2 in overtime on December 12. The game will be a tough battle for playoff position as Nashville is in seventh with 61 points and Detroit is two points back in ninth with 59. The eight to twelve points available in the last four games of the year between the two teams will play a big part in each team's playoff chances. Dan Ellis (11-10-1, 2.59, .912) will start in goal for the Preds while Jimmy Howard (18-11-5, 2.30, .924) will be in the Wing's net. Both teams have several injuries to key players. Detroit is missing Johan Franzen, Thomas Holstrom, and Andreas Lilja. They are expected to have Jason Williams back for his first game in eight weeks. The Predators are still missing Joel Ward, Marcel Goc and Wade Belak. Andreas Thuresson was recalled on Thursday so that hey would have 20 healthy skaters. Bertuzzi and Miller have scored all four goals against the Preds in the two prior meetings. While these two have been dangerous, the Preds also need to keep an eye on the many other weapons that the Wings possess. The Wings have had no shortage of Pred killers over the years. The key will be for the Preds to play with dicipline and keep the puck in their possession as much as possible in order to limit their chances. The Wings have traditionally passed the 40 shot mark against the Preds and the way the Pred defense has had numerous recent lapses in front of the net, that could easily translate into five plus goals. This will be the first time that Jimmy Howard has faced the Preds this year as Chris Osgood has started both games previously this season. Howard has only played a portion of one game against the Preds in his career. Likewise, Dan Ellis has not played against Detroit this season since Peka Rinne has gotten both starts. Ellis has had stellar games at times against the Wings which included some memorable playoff action two seasons ago. Ellis carries a 2-2-1 regular season record against Detroit into tonight's game. Dan needs to recapture the magic against the Wings and cover the puck more instead of allowing rebounds that create additional chances for the opposition. The Predator's penalty kill has given up three goals in the last two games and the power play is now one for seventeen in their last six games. Over the long haul, the hockey gods will not let a team playing this poorly on special teams be successful at winning the number of games needed to make the playoffs. I know it's not hockey but we had the opportunity to attend the Sundance Film Festival (USA) at the Belcourt Theater in Nashville last night. It was a rare treat for the locals who could not travel to Park City, Utah where the festival his held annually. This was the first time in Sundance history that the festival organizers took the best films, and their directors, from the festival to eight cities around the country. Nashville was fortunate to have a theater that specializes in independent films and was chosen to host one of the remote screenings. The film chosen for Nashville was "The Extra Man" which is a comedy about some very quirky folks that live in New York City. Kevin Kline (not the Predator) is an eccentric older guy who escorts elderly rich women on dates around New York. Paul Dano, who is best known for being the silent brother in "Little Miss Sunshine", is perfect opposite Kline as his sexually confused room mate. Katie Holmes is an attractive co-worker of Dano's at an environmental activist's magazine. John C. Reilly is a strange character with a very high pitched voice who lives in the same building as Kline and Dano. There are many other well casted characters in the film that came from the local film community in New York. I'm not sure that I knew that a "spankologist" was an occupation before last night. On had for questions after the film was co-director Shari Springer Berman who shared her thoughts and insights with the audience after the movie was completed. It was interesting to be able to ask about how and why things were done immediately after screening the film. At this point, the film has not been picked up by a major production house so it is unclear when it may be seen in theaters. More than likely, once it is distributed, it will make a return to the Belcourt since it was so well received by the crowd last night. I'm sure the word of mouth buzz by those in attendance will make this a must see film of 2010 in Nashville for those who enjoy independent films. It was an excellent film that may not appeal to mainstream audiences but is for folks who would like slightly off-beat films like "Little Miss Sunshine." I would highly recommend it. Bryan Mullen has a story about the Wing's loss of intimidation, a notes column, and the game at a glance at the Tennessean. John Glennon makes a note of the number of centers that the Preds have signed for 2010-11 already. Jim Diamond has the story of Frankie Bouillon and his kids at the Examiner. Bouillon has good things to say about the local hockey program. Chris Burton has the Game Day Preview at On The Forecheck. David Boclair has an article about Steve Sullivan at The Nashville Scene. Sully talks about the return to normal after the two year roller-coaster that he was on. He also compares the Preds and Wings at the City Paper. Short Shifts has the game story of the Ads 4-1 loss to Hamilton. Mark has his Friday "My View" at the View from 111. Some of the comments that I sent to the Columbus blog, The Dark Blue Jacket were published in today's edition. The Preds were riding high when I wrote that. It's some of the more positive stuff with my name on it here in the last few days. For a look at the other side, The Detroit Free Press has complete Wing's coverage including news that Jason Williams should be back tonight. This weekend is Hockey Across America Weekend. How will you celebrate? Jim Johansson of USA Hockey was on XM204 with Mike Ross taling about the weekend's meaning and other recent successes in US hockey. Forechecker has news that the KHL All-Star game will be aired on ESPN360 on Saturday. Hard to believe that have interest in the KHL when they have little in the NHL. Stay Classy has a look at the race for the Calder trophy with a snapshot of the top rookies so far this season. Shawn Gates has some interesting hockey superstitions. Chris Johnston has the story on the meager accommodations at the Olympic village that will await NHL superstars. In Nashville, it is time to register for PodCampNashville2010 that will be held March 6 at the Cadalac Ranch. @janeqpublic pointed us to this gem of a site called Awkward Family Photos. This gives People of Walmart a little competition for America at its best. Labels: nashville predators sundance film festival. Once again Andreas Thuresson has been recalled from Milwaukee. Jim Diamond reported from practice that Wad Belak is now questionable in addition to Joel Ward and Marcel Goc not being able to play at Detroit on Friday. Nashville, Tenn. (January 28, 2010) – Nashville Predators President of Hockey Operations/General Manager David Poile announced today that the club has recalled forward Andreas Thuresson from Milwaukee (AHL). This is the 6-1, 212-pound winger’s fourth recall of the season. Thuresson, 22 (11/18/87), has appeared in 21 games for the Predators this season, notching three points (1g-2a) and four penalty minutes while averaging 10:10 of ice time. He also has 41 hits to his credit, the third-highest total among Predator forwards. In 24 games for the Admirals in 2009-10, the Kristianstad, Sweden native has 15 points (7g-8a). The Predators play the last of four straight on the road tomorrow night at Joe Louis Arena when they meet the two-time defending Western Conference Champion Detroit Red Wings (6:30 p.m. CT, FOX Sports Tennessee, 104.5 The Zone). Nashville then kicks off a four-game homestand the following night (Saturday) at 7 p.m., when it hosts the Atlanta Thrashers, the team’s closest geographical rival. The home stretch continues Tuesday against Phoenix, next Thursday vs. Colorado, and wraps up Saturday, Feb. 6 against the Western Conference-leading San Jose Sharks. Tickets to all four of these games, and all other regular season contests, are on sale and can be purchased by logging onto nashvillepredators.com. Tickets are also available by calling (615) 770-PUCK and at all Ticketmaster locations. Are The "Hockey Gods" Catching Up with the Predators? Since the six game losing streak at the beginning of the season, the Predators have lost back to back games once and had a three game losing streak once. The current four game losing streak is a season high for the Preds when you exclude the slow start streak. With a game in Detroit tomorrow and a trap game at home Saturday against Atlanta (in the Black and Blues) looming as tough games, the Predators suddenly have their work cut out for them. Unlike the early season streak, and the three game December streak, the Predators have not played horribly. They have simply gotten beat by the other team. They could have won any of the four games with a break or two along the way. For months, I have pointed to the upside that the Preds would have "when" they got their power play going, the penalty kill on track, and Pekka played like he did last year. I never discussed the down side of what would happen when they continued to play poorly on special teams and Pekka didn't shape up. The "hockey gods" appear to have gone other direction and have not shown favor on them in the last four games. They tend to be more punishing when teams don't do the little things like fight for the puck, chase rebounds, and crash the net. What we are currently seeing is what happens when a team plays on the ice the way their statistics look on paper. When you have the 29th best power play and the 26th best penalty kill, you won't win many close games against quality opposition over the long haul especially when you aren't putting the puck in the net, five on five. The Predators have scored nine goals in their last five games which is not as bad as the six goals in six games in the early season losing streak but it is very similar to the six goals in three games during the December three game losing streak. The rotation in goal has led to a lot of mediocre play and no real rhythm in net for either Dan Ellis or Pekka Rinne. Barry Trotz has given Pekka back to back starts twice and he had to be pulled in one game and gave up three goals on seventeen shots in the other. The Predators have reached a fork in the road. Either they will pick up their play and return to the ways that we saw earlier this season or they will continue to be mediocre and slowly fade down past the eighth slot in the standings and out of a playoff position. I really don't expect a lot of movement at the trade deadline so the turn-around is going to have to come from the players that they have in Nashville and in Milwaukee. Barry Trotz commented that when the team got close to being healthy with the return of Jerrod Smithson, Jordin Tootoo and Jason Arnott they started losing games. I don't think that is a complete coincidence. While some of the younger guys from Milwaukee do make occasional rookie mistakes, they play like their job in the NHL is on the line every night, and it is. We need to see that same fight for life from all twenty players that the Preds put on the ice on any given night. That is what "Predator hockey" is all about and that is not what we have seen in the last four games. They can't afford to have any "passengers" as Trotz likes to say. Hopefully, the four game streak is enough of a wake up call and we will see the old Preds back on the ice tomorrow night playing like they are fighting for their lives. Bryan Mullen has some quotes from the current losing streak and indicates that the team is not yet to the panic stage. As stated above, the team is at a crossroads and need to reel in the streak in Detroit tomorrow. Forechecker asks "Are the Preds who we thought they were?" in a post reflecting back on the Preds current issues. He also has an interview with Mike Santos from the Thom Abraham show. Jeremy Gover has an article about Patric Hornqvist and speculates that he could be the Pred's all time single season goal leader. The Predators signed Marcel Goc to a one-year extension yesterday. Bryan Mullen has comments about the signing from David Poile. Jim Diamond has a perspective on the new contract. Big Kev has comments about the signing. Admirals Short Shifts has speculation about the whereabouts of Alexander Sulzer who appears to be in no man's land or involved in some type of trade. Here was their original recall article. The Olympic Hockey Blog has a profile of Shea Weber. Rachel at What The Puck discusses the Hockey Fights Cancer night on Saturday. From Admirals.com comes a #2 night which sounds odd. Everyone in attendance will receive a #2 pencil. Packers kicker Mason Crosby will sign autographs. Matt Reitz has his State of the Union in hockey and covers a wide range of issues facing the NHL this year. Puck Report commemorates the beginning of the longest road trip in NHL history by the Vanouver Canucks. Darren Dreger has a list of ten players that will move at the deadline. Ethan Moreau would be a great pick up for the Preds with only a $1.75 million salary for next season. While not a big point producer, he could provide leadership and was last year's winner of the King Clancy Trophy for community involvement and leadership on and off the ice. Scotty Wazz has a few thoughts on the whole Carey Price-Andrei Markov "heart" situation. If a tenth of all this is true, it is an untenable situation in Montreal. The dispute between the CBC and the Vancouver Canucks over the Alex Burrows-Stephane Auger matter has been resolved but no one is saying much about in in Vancouver. Rob Higgins has his weekly fantasy update at the Toronto Sun. In somewhat of an out of the blue announcement this afternoon, the Nashville Predators re-signed Marcel Goc to a one year deal for the 2010-11 season. It is a deserving contract for one of the surprise players this season. It is a good sign that David Poile is working to tie up a few loose ends for next season early in the year. The $775,000 price tag is somewhat surprising considering that Goc has had his best season this year. I would have expected something in the $1 million range, so it appears that the Preds indeed get a bargain. Nashville, Tenn. (January 27, 2010) – Nashville Predators President of Hockey Operations/General Manager David Poile announced today that the club has signed forward Marcel Goc (MAHR-sehl GAWCH) to a one-year contract worth $775,000. Goc, 26 (8/24/83), has already set a career high in goals (10) in 49 games this season, and is just three points shy (10g-9a) of a personal-best in points attained during his rookie season of 2005-06 (8g-14a). The 6-1, 202-pound center paces the Predators in face-off winning percentage (51.5 percent) while playing 14:08 per game, and has produced 16 points (8g-8a) in his last 25 outings after starting the season with three points (2g-1a) in his first 24 contests of 2009-10. Named to his third straight German Olympic Team on Dec. 30, Goc is the highest German ever selected in the NHL Draft (20th overall in 2001 by San Jose). The Calw native has played 314 career games with Nashville and San Jose since 2005-06, posting 73 points (29g-44a) and 84 penalty minutes. Goc has also seen action in 37 playoff games (3g-5a-8pts), and made his NHL debut during the 2004 postseason. After a disappointing loss in Columbus last night, the Predators travel company plane added insult to injury by not being ready when they arrived at the airport. The team waited almost two hours on a bus on the tarmac waiting for a customs agent to clear the plane to travel to Tennessee. My first thought was that the history books have been wrong for the last 145 years or so and that the South was successful in seceding from the North. The reality was that the plane had come from Canada and needed to be released by customs before going further. The delay led to some interesting Tweets by Tom Callahan, Dan Ellis and Steve Sullivan. The biggest heart breaker was that Sully was going to miss donuts with dad at his kid's school this morning if they didn't get back. It appears that they did make it back eventually. If you were planning on going to practice at Centennial this morning, you should call ahead to see if it really going to happen. John Glennon has a game story, notes and postgame ponderings. Jim Diamond's story starts with the jumbled standings where the Preds have fallen to seventh and are only two points ahead of Detroit. In the Blog arena stories come from Brandon Felder, Forechecker, The View from 111, amd What the Puck, who had a live Blog featuring her friend Bethany from Columbus who writes for Kukla's. For the Columbus view on the game go to Blue Jackets Extra for complete coverage. Admirals Short Shifts has the story of the Ads 5-2 loss in Texas last night. It did not sound pretty. The Ads are headed home for a five game home stand. They also have news of a new URL for their site and a link to Eric's podcast appearance with us on Monday night. Preds101 takes a look at the Pred's deal with Sommet and gives some pluses and minuses on what is known. This is a good evaluation of the situation. Chris Wassel and I combined to produce an NHL Apocalypse posting last summer and now Chris has stated an eight part (at least) series on the Referee Apocalypse with plenty of video to prove his point. James Mirtle takes a look at what it will take for teams to get into the playoffs based on the standings after Monday's action. Ryan at the RLD has the top five playoff commodities available. Georges Laraque responds to his release from the Canadians at his personal blog. Rogers SportsNet has a story indicating Laraque may play in Sweden for free. Adrian and Chris Nadeau have Episode #38 of the Hockey Zen TV and discuss the question, "Is hockey at a crossroads." Michell Kenneth points us to Vanity Fair's Olympic hockey coverage which today has some cheesecake photos of Sweden's Hockey Studs. I think we see what to expect from their "coverage". Michelle also has a few not too happy words about the series. Coming off good ratings last week, Steve Lapore has NBC's press release for this Sunday's Stanley Cup finals rematch. Steve also has the release about the new Versus "Community" web site. Scott Burnside and Pierre LeBrun have fantasy All-Star teams since there will not be a game this year. For fans of the green guys in Vancouver, you can follow them on Twitter @TheGreenMen. I wonder if they will be at the Olympics. The Nashville Predators lost their fourth game in a row to Columbus by a 3-2 score Tuesday night at Nationwide Arena. The Preds five-game win streak against the Jackets also came to an end. Back to back goals thirty-nine seconds apart by Kristian Huselius and Fredrik Modin midway through the third period put the Blue Jackets ahead 3-0. Derick Brassard had the other goal for Columbus. The Preds fought back with quick goals by Marty Erat and Patric Hornqvist to make it a contest but their efforts fell short. Steve Mason played one of his better games of the season stopping 29 of 31 Predator shots including all 11 from the Predator power play. Pekka Rinne looked solid in net but failed to have much support in front of him as he stopped 14 of Columbus' 17 shots. The game got off to a fast start with only four stoppages in the first 7:40 of play. Both teams were skating hard with plenty of up and down action. At 9:13, Columbus was called for too many men on the ice putting the Predators on the man advantage. The Blue Jackets never allowed the Preds to set up and did not allow a shot. The Predators went on the power play again at 16:01 when Sammy Pahlsson was called for hooking Steve Sullivan. The Preds managed two shots on the man advantage but was unable to convert. The first period ended with the Predators out shooting the Jackets 7-5 and leading in the Corsi numbers 14-7. The game was similar to the New Year's Eve game tat was fast moving and played close to the vest. Columbus went on their first power play at 2:14 of the second period when Farncis Bouillon tripped R. J. Umberger. The Jackets were unable to get a shot on net but the Preds did get a short-handed scoring chance. Chris Clark was called for hooking Cody Franson at 5:29. The Predators poured on the pressure and were credited with four shots on the man advantage but did not convert. The Jackets returned to the man advantage at 9:24 when Shea Weber let his stick get away from him and it caught Voracek in the face. Columbus managed a post but no shots as they could not find the net. Through the first sixteen minutes of the second period the Jackets only managed one shot. However, Columbus struck pay dirt on a three shot flurry when Derick Brassard's tip off a Milan Jurcina shot got past Rinne and slowly crossed the red line to give Columbus a 1-0 lead. Dan Hamhuis was called for unnecessarily cross-checking Rick Nash at 17:47 behind the Predators net. The Predators appeared to be out of kilter but only allowed the Jackets one shot on their power play. For the Period the Predators out shot Columbus 10-5. The Corsi numbers were much closer at 13-12 with the Preds having a slight advantage. The only number that mattered was the 1-0 Blue Jacket's lead. The third period started with plenty of hard hitting and up and down the ice skating. Steve Sullivan missed an early opportunity, on a breakaway, when Steve Mason poke checked the puck as Sullivan tried to lift the puck into the net. Jason Arnott was called for hooking Fredrik Modin at 6:56. A slow motion replay clearly showed that Modin was holding Arnott's stick. None the less, at 8:00 Kristian Huselius received a cross the blue ice pass from Rick Nash and put it past Pekka Rinne for a power play goal to put the Jackets ahead 2-0. Thirty nine seconds later Fredrik Modin swatted at a loose puck in the Predator's blue ice that Jason Arnott was attempting to kick away. The puck crossed into the net and it was basically "game, set, match" at 8:39 when Columbus went up 3-0. Marty Erat tried to make a game of it at 10:06 when he took a feed from Ryan Jones and placed it over Mason's left shoulder to the inside of the post to pull the Preds within two at 3-1. At 13:36, Jan Hejda was called for interference on a delayed penalty to give the Predators a chance on the man advantage. As time expired on the penalty clock at 15:36, Patric Hornqvist picked up the rebound off of a Marty Erat shot and put it in the net to bring the Preds within a goal, 3-2. The Predators put on a mad rush down the stretch but had difficulty even pulling Rinne from the net. The game came to an end with a couple of good scoring chances for the Preds but the game ended 3-2 giving the Predators a four game losing streak. In the third period, The Preds out shot the Jackets 14-7 giving them a 31-17 advantage for the game. Once again, as we have seen so many times this season, the Predators played well early in the game but could not put the puck in the net. The Predators had numerous scoring chances early and had nothing to show for it. Columbus gained confidence by playing even in the first period, and then, for the first time in eight games, the Jackets scored first in a contest. By the Preds not getting on the board early, struggling teams gain confidence and convert that into opportunities for wins and the Predators have been willing to go down that road far too often in the last few weeks. A couple of early goals, against a struggling Steve Mason, could have had him hanging his head and willing to give up a few more goals. Instead, Mason, and the Blue Jackets, gained confidence and had one of their better games of the year. The Predators waited until the mid-point of the final period to pick up the pace and put a couple of shots into the net. There is no way that you can wait until you are down by three goals late in the game to effectively mount a charge and win hockey games. The Predators did not work for the area in front of the Columbus net and did not go after rebounds with the same intensity in the first fifty minutes of the game as they did when they were desperate at the end. A little more desperation to start the game is what is needed. The Predators have played just good enough to lose close games in the last three outings on the road against conference rivals Phoenix, Colorado and Columbus. They did not play bad games in any of the three but managed to basically get beat by the competition. Barry Trotz mentioned after Friday's game that this was an evening out process from the hockey gods where the Preds had won a few that hey did not deserve earlier in the season. The Conference race is so tight at this point, that the Predators cannot afford to not be fully engaged for a full sixty minutes in every contest from here to the end of the season. In the Western Conference any brief period of a lack of intensity will be taken advantage of by the opposition immediately. The Predators returned to Nashville after the game and will hit the ice at Centennial on Wednesday morning to prepare for Friday's game in Detroit. They begin a four game home stand on Saturday against Atlanta that will be the last games at the Sommet Center before the Olympic break. Tonight, the Nashville Predators (29-19-3) will make their final regular season trip into Nationwide Arena to play the Columbus Blue Jackets (20-25-9) in a bitter division rivalry. Both teams badly need a win. The Predators have lost their last three outings and are in desperate need of two points in tonight's game. After winning three in a row earlier this month, Columbus is 2-5 in their last seven games. This will be the fifth meeting between the two clubs this season and the third in Columbus. In the Predators last visit to Columbus, on New Year's Eve, the Preds won 2-1, when David Legwand scored a goal 28 seconds into overtime. Also in Columbus on December 14, Steve Sullivan had his seventh career hat trick leading the Preds to a 5-3 win. The first two meetings of the year were in Nashville where the Preds won both games 4-3, in shootouts. David Legwand had the game winning shot on November 21. On December 10, Mathieu Garon's shoot out win streak was ended by Steve Sullivan's game winning shot. Tonight's meeting will provide a match-up of the last season's top two rookie goaltenders with Steve Mason (12-17-6, 3.30, .891) going for Columbus and Pekka Rinne (18-9-2, 2.80, .904) in net for the Preds. The Predators will be missing Joel Ward and Marcel Goc who did not make the trip with the team but hopefully will be ready to return for Friday's game with Detroit. As always when these two division rivals play, you can throw the record book out the window. In spite the Preds winning the last five contests, Columbus has gotten a point in four, three via a shootout and one in overtime. Anything can happen in this rivalry as the games are played much like a chess match between Barry Trotz (who is seen as Darth Vader by the Columbus fans) and his friend, Ken Hitchcock. Star Wars references run rampant as Nashville is also seen as "The Evil Empire". The bottom line is that no matter the what the records say or what the stats show on paper, this match-up is always a bloody fight to the finish. The Predators, who have lost three in a row, did not play poorly in the last two road games but they simply did not win. They did play fairly well in Colorado but the game turned on a questionable call when a goal was waived off on a goaltender interference penalty. It is no short order but the Predators need to come out like a team possessed and take it full out to the shaky Steve Mason right from the start and never allow the Blue Jackets, or their crowd, take control of the contest. Just as winning became a habit earlier this year, losing can also become a bad habit that the Preds do not need to fall in to. Coming close and moral victories do not add points to the standings. Games with Columbus have traditionally been very rough and tumble affairs. Jordin Tootoo has one sixth of his career penalty minutes against the Jackets. Both he and heavyweight Wade Belak will be dressed for tonight's game and each need to show discipline and not retaliate to Columbus' efforts to draw the Preds into penalties. In recent games, Wade Belak has been drawn into several fairly pointless heavyweight fights that have done little to protect the well being of his fellow players or rally the team. I am hopeful that any fisticuffs that occur tonight will have a purpose and provide a boost the the Preds. The Predators will return home after the game and practice at Centennial on Wednesday. They will travel to Detroit on Thursday and play the Wings on Friday night before returning home to start the last home stand before the Olympic break against Atlanta on Saturday night. Team USA Captain Natalie Darwitz was a guest on Monday night's PredsOnTheGlass Radio show. In a thirty minute interview Darwitz covered a wide range of topics. It was an interesting to hear from the captain of the women's team with the Olympics less than three weeks away. The 25 year old Darwitz discusses her ten years in the USA Developmental Program and her desire to add a gold medal to the Bronze and Silver she won in the past two Olympics. She also discusses women's hockey in general and the struggle to find ice time for the non elite players once they graduate college. There was also a discussion about fighting in men's hockey and the NHL. She was a fun guest and we look forward to watching her in action in Vancouver. The second half of the podcast is an interview with Eric Kent of Admiral's Short Shifts. Eric and I had an extensive discussion of the Admirals personnel and the players that have been up and down with the Predators this season. Eric is our eyes and ears in Milwaukee so it is always good to catch up with the latest information from the AHL. John Glennon has the story about Pekka Rinne starting tonight in Columbus, a notes column that includes the injury situation and the Game at a Glance. David Boclair has a piece about Patric Hornqvist parking himself in front of the opponent's net and being the king of the face wash as a result. Mark at the View from 111 has an article about the critical run of games coming up and has a call to action for several players. In a press release yesterday, the Predators indicated that their dispute with the Sommet group has been resolved with the name staying on the building for now. They will be free to seek a new sponsor. The Nashville Post adds perspective and also mentions the team's meeting yesterday with the "Gang of Three" from the Sports Council. Dirk The Forechecker has an analysis of Jason Arnott's scoring pattern and the interview with Barry Trotz from the Thom Abraham show yesterday. Chris Burton already has tonight's game preview up at On The Forecheck. For those wanting a look from the other side on tonight's game, The Columbus Dispatch has the full story with a preview, probable lines and more. It does appear that Steve Mason will start in goal, pitting last year's top two rookie tenders once again. The cat is out of the bag on the Section 303 viewing party on February 28 if the USA makes the finals. Go here for details. The Milwaukee Admirals site has an article about Ben Guite and what he has accomplished in the classroom. The Preds are ranked eight in this weeks Power ratings at NHL Hot Stove. They give me props for my post from last week on the Preds at the Trade Deadline. NBC has a good story on Ryan Suter and his family's Olympic lineage. Patrice Cormier was suspended for the rest of the season and the playoffs by the QHL. Puck Daddy looks at the suspension and whether the Devils will attempt to move him to the AHL. Here is the official release from the league. After a look at the Western Conference yesterday, Matt Reitz looks at the biggest surprises in the East today. Steve Lapore asks "Should the NHL Give Up on Television?" He also has news that Sunday's Pen-Flyers game tied for the highest rated Sunday broadcast since NBC took over the NHL package. Kevin Westgarth has another installment of his blog from his life in the AHL as an enforcer. It is always and interesting perspective. There was a big deal made about the make up game in New Jersey where the teams played three days straight. It is a common occurrence in the AHL. In the aftermath of John Tortorella's verbal sparring with Larry Brooks last week, he is still not warming up to reporters as Jon Gabrielle reports at The Hockey Writers. Miracle on Ice Goalie Jim Craig was on XM204 Hockey this morning on Monday. Here is the audio clip. The NHLPA has reached a tentative agreement to settle with ex-leader Paul Kelly. It's not as big as Conan's money but still big dollars. Michele Kenneth saw the Tooth Fairy and gave it a somewhat positive review. Maybe if the rest of us that have been bashing the NHL for being involved in the project actually saw the move, it might surprise us. Interesting question suggestions to Mirtle to ask the King's players who are visiting Toronto. As reported by Admirals Short Shifts on Sunday, Cal O'Reilly is returning to Nashville for Tuesday's game. With Joel Ward and Marcel Goc iffy for Tuesday's game with Columbus, this will give the Preds at least 20 healthy players for the contest. Colin Wilson was also rumored to be recalled but it appears that it is not happening, yet. Nashville, Tenn. (January 25, 2010) – Nashville Predators President of Hockey Operations/General Manager David Poile announced today that the club has recalled center Cal O’Reilly from Milwaukee (AHL) on emergency conditions. It is O’Reilly’s fourth recall of 2009-10. O’Reilly, 23 (9/30/86), posted three assists in four games during his most recent recall to the Predators from Jan. 9-15, which included his first career multi-point/assist performance on Jan. 12 at Edmonton. The Toronto, Ont., native, who leads the Admirals in points (40), assists (36) and plus/minus rating (+19) in 35 games, played in his second consecutive AHL All-Star Classic last Tuesday, registering an assist. Nashville’s fourth choice, 150th overall (fifth round), in the 2005 Entry Draft has four assists in 13 games for Nashville this season, and nine points (3g-6a) in 24 contests since making his NHL debut on Feb. 28, 2009. The Predators continue a four-game road trip with contests at Columbus tomorrow night (6 p.m., FOX Sports Tennessee) and Detroit on Friday (6:30 p.m., FOX Sports Tennessee) before opening up a four-game homestand by hosting the Atlanta Thrashers next Saturday (7 p.m.). Nashville will then host Phoenix (Feb. 2), Colorado (Feb. 4) and San Jose (Feb. 6) in its final three home games before the Olympic Break. Tickets to these games, and all other regular season contests, are now on sale and can be purchased by logging onto nashvillepredators.com. Tickets are also available by calling (615) 770-PUCK and at all Ticketmaster locations. Updated Programming note: Eric Kent will be on from Admirals Short Shifts instead of Ryan Miller. After a couple of weeks off for Pred's games we will be back with a new edition of POTG Radio tonight at 7:00 Central. This week we are thrilled to have Natalie Darwitz, the Captain of Team USA in Women's Hockey. With the Olympics a few weeks away we will find out how the team came together and what to expect at the games. We will also have Ryan Miller from Admirals Short Shifts to take look at how future Predators are performing at the mid-point of the season. With the recall of Colin Wilson and Cal O'Reilly last night it will be interesting to see what they have to say about Wilson's progress. Please join us live or on the podcast after the show. The biggest news on Sunday for the Predators was broken by Ads Short Shifts last night about the return of Colin Wilson and Cal O'Reilly to the Predators. It was then beaten out by a bigger story that Colin wasn't coming, or that they may or may not send him today. Anyway O'Reilly is coming and we'll see what happens next. Bryan Mullen reported earlier in the day that Joel Ward and Marcel Goc were questionable for Tuesday's game at Columbus. Someone either got better or the Preds will go with what they have against Columbus tomorrow. Bryan Mullen has a good story on Cody Franson this morning at the Tennessean. In my opinion, Franson filling the sixth D-man spot has been one of the top stories of the year. Jim Diamond has his weekly Preds prospects round-up including the news that Taylor Beck was the CHL player of the week. Section 303 had a new edition of the 303:30 on Saturday. Filmmaker Tommy Haines, who made Pond Hockey, was the primary guest. They also had a big announcement about an upcoming event. Check out the podcast for details. Ryan at the RedLightDistrict writes Jason Arnott a letter calling him out for his recent disappearing act. Ryan makes several good points that would be tough reading for the captain but it needed to be said. 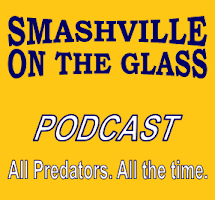 Preds101 starts the week off with a preview of this week. Forechecker has the story of the green guys in Vancouver. Dirk also went on Thom Abraham on Friday to discuss enforcers in hockey. His audio clip has been added to his prior article. Mark has his weekly View at 111 (not from). Confusing. In Milwaukee, on the ice, the Admirals had two shootout victories in San Antonio over the weekend. For the story of Saturday's and Sunday's games Short Shifts has the story. Last night's BTR show from Chris Wassel and The Program was one of their best episodes ever. They had Carrie Milbank on for over an hour and had a great interview with her on a wide range of topics. This podcast is a must listen where you will find out is Carrie would like to share a cab ride with Patrick Kane. Her answer will astound you. It's not what you would hear on NHL Network. The video highlight from last week was John Tortorella and Larry Brooks going at it once again. I love this stuff. Matt at View from My Seats has joined the anti three-point game crowd as it is structured today. Matt also has the biggest surprises in the Western Conference. Adrian Dater lists his five most disappointing teams at Versus. Mike Chen of Kukla'a Korner has flown the coup and landed in James Mirtle's From the Rink seat at SB Nation. Brian Costello at The Hockey News writes about desperate times in Calgary and what they need to do to turn it around. Scotty Wazz writes about the Un-Mighty Quinn and the 0 for 2010 streak the Oilers have going. Puck Daddy has the story of the Las Vegas Wranglers dressing like Girl Scouts. Seriously, they have a really different looking jersey that they will wear and auction off for charity. The Predators reassigned Alexander Sulzer once again in order for him to play a couple of games with Milwaukee to stay fresh if he is needed with the Preds. Sulzer is expected to play tonight and Sunday with the Ads in San Antonio. As well as Cody Franson has been playing, it has been difficult for Sulzer to crack the top six. Nashville, Tenn. (January 22, 2009) – Nashville Predators President of Hockey Operations/General Manager David Poile announced today that the club has reassigned defenseman Alexander Sulzer (al-ehx-AN-duhr SUHLT-suhr) to Milwaukee (AHL). Sulzer, 25 (5/30/84), has a pair of assists in 13 games for the Predators in 2009-10. Selected to Germany’s Olympic Team for next month’s 2010 Vancouver Games, the 6-1, 204-pound blueliner also has 13 points (2g-11a) in 12 games at the AHL level this season. The Predators continue a four-game road trip with contests at Columbus on Tuesday (6 p.m., FOX Sports Tennessee) and Detroit on Friday (6:30 p.m., FOX Sports Tennessee) before opening up a four-game homestand by hosting the Atlanta Thrashers next Saturday (7 p.m.). Nashville will then host Phoenix (Feb. 2), Colorado (Feb. 4) and San Jose (Feb. 6) in its final three home games before the Olympic Break. Tickets to these games, and all other regular season contests, are now on sale and can be purchased by logging onto nashvillepredators.com. Tickets are also available by calling (615) 770-PUCK and at all Ticketmaster locations. The Nashville Predators lost the the Colorado Avalanche 2-1 in a penalty laden game where all three goals were scored on power plays. Brandon Yip had the game winner early in the second period. Matt Duchene had Colorado's opening goal. The Predators only goal came from rookie Cody Franson. The officials were the stars of the game as they were front and center whistling a total of eighteen penalties, ten against the Preds and eight against the Avalanche. The most controversial penalty occurred with seven and a half minutes left when a Ryan Suter goal, that would have tied the game, was waived off on a goalie interference call that Craig Anderson did a good job of selling to the officials. Replays indicated that the contact was incidental and probably did not interfere with Anderson's ability to stop the shot. Pekka Rinne was strong in net stopping 21 of 23 Colorado shots. The two goals allowed were ones that Rinne had little chance to stop. Craig Anderson stopped all but on of the thirty Predator shots. The Preds started the game with an early power play chance early at the 2:00 mark in the first period when John-Michael Lyles was called for slashing. The Preds had a couple of shots but neither made it in the net. The nightly pointless fight broke out at 11:41 when David Koci pushed Wade Belak down and Belak got up and started trowing punches. Both received five for fighting. Ryan Suter put the Avs on the power play on a really blatant cross-checking effort at 11:56. With 23 seconds left on the Suter penalty, Steve Sullivan was called for hooking to put three Preds in the box and give the Avs a five on three advantage. Before the first penalty expired, Matt Duchene scored on a nice feed into the slot from John-Michael Lyles to give the Avalanche a 1-0 lead. Earlier on the five on four power play, Pekka Rinne did some quality acrobatics keeping a couple of shots out of the net, but he had little chance on the Duchene shot. Kevin Klein was called for a high sticking double minor at 18:12 to put the Pred in a hole for the remainder of the first period and the first 2:12 of the second. With 36 seconds left in the the period after some extracurricular activity in Pekka Rinne's net, both team's players matched up for a dance and the only fight that was sustained was Steve Sullivan and Wojtek Wolski. Both Sully and Wolski received fighting majors. Wolski also received a two minute slashing call to even the teams on the ice at four on four. The Predators out shot the Avs 12-4 in the first period but the Colorado was one for two on the power play to take a 1-0 lead into the break. The second period started with the completion of the first period penalties but neither team scored. Wade Belak was called for hooking at 5:43 on a ticky tack hooking call while battling two Avs behind their net. The Avs got their second power play goal at 7:25 when Brandon Yip found himself with the puck in front of an empty side of the net on a pass from Darcy Tucker to give the Avs a 2-0 lead. At 8:18 the Predators went on the man advantage when Jordin Tootoo was slashed by Cody McLeod. The Preds made the Avs pay for the miscue when Cody Fransen had a great shot after a two step pass from Jason Arnott to Patric Hornqvist to Franson to cut the Avs' lead in half to 2-1. Franson did a slight double clutch before launching the shot which may have confused Anderson a bit. Patric Hornqvist was called for tripping after he was knocked down by Paul Stastny and Hornqvist tried to retaliate and was caught pulling Stastny down. The Predators managed to kill the sixth Avalanche man advantage opportunity of the evening. Francis Bouillon added to the endless string of penalties against the Preds at 14:19 when he was called for boarding. The Preds went unscathed on the Colorado power play. With the period winding down at 19:39 T J Galiardi was called for roughing to give the Predators a carryover power play. Cody Franson unloaded a couple of quick shot attempts before the period ended but did not find the net. The second period was a complete turn around from the first with the Avs leading in shots 12-5. The Avs were one for three on the man advantage which was surprising that they didn't have more shots since they had six minutes of power play time. The Predators started the third period with 1:39 left on the Galiardi penalty. The Preds had one shot but nothing to add to the scoreboard. The Preds returned to the power play at 11:33 when Kyle Cumisky flipped the puck over the net and was called for delay of game. At 12:29 the Predators appeared to have tied the game but the goal was waived off when the worst of many penalties was called against Patric Hornqvist for allegedly interfering with Craig Anderson. The infraction was not visible on any replay angle on the tube. At 15:46 the Predators set their season high for penalty kills when Ryan Jones was called for tripping. After Barry Trotz pulled Pekka Rinne the Preds made a mad rush for the net and got a post with 36 seconds left. Two seconds later, Paul Stasney was called for hooking to give the Preds a six on four advantage down the stretch. The Preds drove several shots toward the goal but were never able to connect and the game ended with the 2-1 Colorado victory. With eighteen penalties in the game you would expect the special teams to be the focus of the game. A total of 50 minutes of penalties, 30 of which were minors, allowed for plenty of odd man action. All three goals in the game were power play goals. While the Predators and their fans felt unjustly treated by the officials due to a few questionable penalties, especially the goaltender interference call, the Preds really need to look at themselves. The undisciplined play on a really sloppy Ryan Suter cross checking penalty led to the first goal. The second goal came after Wade Belak took a hand off the stick making it easy for the officials to call a hooking penalty. All of the other penalties that the Preds were frustrated with resulted in successful penalty kills. The ones that cost them were legitimate calls. Steve Sullivan's fighting major from his scrap with Wojtek Wolski was his second regular season career fight according to HockeyFights.com. The first was on March 26, 1997 with Tony Granato when Sully was with the Leafs. Wolski had never been in an NHL fight. passionless Belak fight as he was pushed down and retaliated against Koci. The Predators returned on after the game and will have Saturday off before returning to the ice on Sunday to prepare for a quick trip to Columbus to play the jackets on Tuesday. TGIF Round-Up and Trouble in Pred Land?